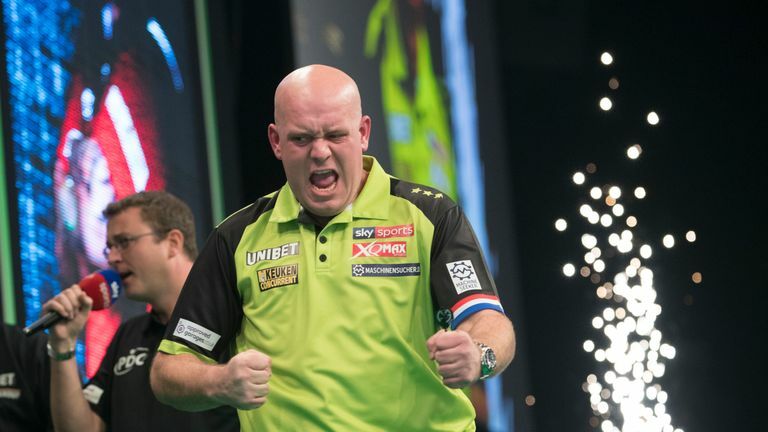 Chisnall eventually scooped the Players Championship 2 title by beating Glen Durrant in the final on Sunday but the show was stolen by a record-breaking amount of perfect legs. Chisnall's nine-darter came against Rowby-John Rodriguez in round three, after Nentjes had done the same in a 6-0 win over Mervyn King. Dobey, who shone in last week's Premier League Darts, then scored his nine-darter against Dave Prins. Van Gerwen then got in on the act by hitting nine perfect arrows - but he was still beaten 6-3 by Jonny Clayton. That ended the world champion's unbeaten streak that ran back to November. After the slew of nine-darters, more than have ever been recorded on the same day before, Chisnall eventually took home the top prize. "I played well today and I think I deserved it because I'm one of those players who never gives up," said Chisnall who won his first PDC title in 18 months. Durrant's run to the final was an impressive effort before he steps into Premier League Darts on Thursday, in place of the injured Gary Anderson. Durrant will play Daryl Gurney.